We’d love your help. Let us know what’s wrong with this preview of Hitlerland by Andrew Nagorski. Some Hitler’s rise to power, Germany’s march to the abyss, as seen through the eyes of Americans—diplomats, military, expats, visiting authors, Olympic athletes—who watched horrified and up close. By tapping a rich vein of personal testimonies, Hitlerland offers a gripping narrative full of surprising twists—and a startlingly fresh perspective on this heavily dissected era. Some of the Americans in Weimar and then Hitler’s Germany were merely casual observers, others deliberately blind; a few were Nazi apologists. But most slowly began to understand the horror of what was unfolding, even when they found it difficult to grasp the breadth of the catastrophe. Among the journalists, William Shirer, Edgar Mowrer, and Dorothy Thompson were increasingly alarmed. Consul General George Messersmith stood out among the American diplomats because of his passion and courage. Truman Smith, the first American official to meet Hitler, was an astute political observer and a remarkably resourceful military attaché. Historian William Dodd, whom FDR tapped as ambassador in Hitler’s Berlin, left disillusioned; his daughter Martha scandalized the embassy with her procession of lovers from her initial infatuation with Nazis she took up with. She ended as a Soviet spy. To ask other readers questions about Hitlerland, please sign up. Excellent book and a necessary read for anyone interested in this time period. A series of opinion pieces, anecdotes and historical accounts from the 1920's up to the start of WWII as seen through the eyes of American journalists, reporters, correspondents and diplomats who were living, working and writing in Germany. Fascinating insights, some new thoughts and opinions I'd not yet heard of, as well as heart-wrenching accounts of what these people saw, witnessed and wrote about. To home on a post Excellent book and a necessary read for anyone interested in this time period. A series of opinion pieces, anecdotes and historical accounts from the 1920's up to the start of WWII as seen through the eyes of American journalists, reporters, correspondents and diplomats who were living, working and writing in Germany. Fascinating insights, some new thoughts and opinions I'd not yet heard of, as well as heart-wrenching accounts of what these people saw, witnessed and wrote about. To home on a postcard, in a personal diary, or on the front pages of the biggest papers in the US, this is all about what THEY saw, first-hand, primary source, etc., etc. There were those immediately enamored of Hitler, his rise to power, the society he changed, scripted and made into his own - and those who were not. There's also a little bit of analysis on why people view events the way they do - how we can change over time, going from adulation - 'what a great man!' - to the realization of what Hitler was all about - 'hell, how could we have been so wrong?' (And of course, there are always the few who know the devil the minute they see him.) I found the entire premise of this book absolutely fascinating and worthwhile. So much so I'm searching out other writings - memoirs, novels, etc. - that many of those mentioned in the book went on to write later. 1. She had the opportunity to meet Hitler and shake his hand. She said that he had the most clear, deep blue and sincere-looking eyes that she had ever seen. They were such that one wanted to believe in and trust in any thing that he would offer. 2. Hitler's regime took her away from her family to work in slave-like conditions in a factory for the war effort. This was a fascinating story of the rise of one of the most evil men in all history. Moreso, it's the story of a country and a capital city itself, as well as individuals that saw firsthand the development of a political movement that has since become synonymous with terror and murder the world over. The Americans that lived and worked in Berlin in both the 20's and 30's had a definitive front row seat to history. It is a time and a place that probably none of us would care or even want to visit This was a fascinating story of the rise of one of the most evil men in all history. Moreso, it's the story of a country and a capital city itself, as well as individuals that saw firsthand the development of a political movement that has since become synonymous with terror and murder the world over. The Americans that lived and worked in Berlin in both the 20's and 30's had a definitive front row seat to history. It is a time and a place that probably none of us would care or even want to visit. I am deeply mystified by the creation and overall precepts of the Third Reich. That isn't to say that I am condoning the behavior of those that were in power during that time period. I just find it generally intriguing how a people could make themselves be so willingly able to accept and/or live under. At times disturbing yet showing a side of history that most have never (or have yet) to see, this is a story played out under great periods of duress and excruciating tensions as the world eked slowly closer and closer to conflagration itself. * A perfect compliment to this book would be Erik Larson's "In the Garden of Beasts". While many books abound about the experiences of Americans in Paris and London during the 1920s and 1930s, there are correspondingly few books available about the experiences of those Americans who spent time in Germany from the 1920s to the early 1940s. This particular book stimulated my curiosity about some of these Americans --- journalists, military officers, writers, scholars, and diplomats --- one of whom first became aware as early as 1922 of a then insignificant nationalist, right wing p While many books abound about the experiences of Americans in Paris and London during the 1920s and 1930s, there are correspondingly few books available about the experiences of those Americans who spent time in Germany from the 1920s to the early 1940s. This particular book stimulated my curiosity about some of these Americans --- journalists, military officers, writers, scholars, and diplomats --- one of whom first became aware as early as 1922 of a then insignificant nationalist, right wing political party and its leader Adolf Hitler, and observed the subsequent growth of the Nazi Party and Hitler's ascension to power in Germany in 1933. This is the first "research for my writing" book I am reading on Kindle. I have figured our how to highlight and record notes from a Kindle book. It actually works very well. 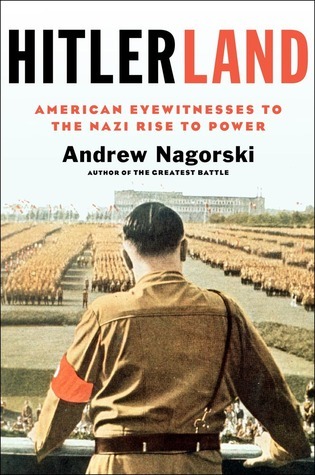 I had been curious about Andrew Nagorski's Hitlerland since it came out, but until now had always held back because of its off-putting title. For some reason I found the term "Hitlerland" a bit too hip, and bit too sardonic (given the subject), with perhaps a whiff of lightweight revisionism. Wrong. Oh, I may have been right about the sardonic nature of the word, but as it turns out, "Hitlerland" (and "Naziland") were products of their time, and were definitely earned. The terms were coined, pro I had been curious about Andrew Nagorski's Hitlerland since it came out, but until now had always held back because of its off-putting title. For some reason I found the term "Hitlerland" a bit too hip, and bit too sardonic (given the subject), with perhaps a whiff of lightweight revisionism. Wrong. Oh, I may have been right about the sardonic nature of the word, but as it turns out, "Hitlerland" (and "Naziland") were products of their time, and were definitely earned. The terms were coined, probably in the late 1930s, by a journalist named Pierre Huss, who worked for the International News Service. He would use them in his own account of the Hitler years, The Foe We Face (which is now available again via Kindle). Essentially the terms are meant to show the growing sense among the Americans in Germany of a disturbing alternative reality taking hold in Hitler's Germany. Nagorski's book gathers together, in something of a small miracle of synthesis, numerous accounts of Americans who happened to be in Germany at the time of Hitler's beginnings in the wild and decadent Weimer days of the early 1920s, up through the U.S. entry into the World War 2. Nagorski draws on letters, unpublished and published manuscripts, journals, etc., from a wide range of Americans ( journalists (primarily), government officials, missionaries, writers, tourists, etc. ), to follow the ascending and darkening Nazi arc. Highly recommended. Large chunks of this were so boring I had to stop and unglaze my eyes - reading about Josephine Baker will do that to me. But Nagorski, a former Newsweek journalist, does a decent job of synthesizing a large number of both published but long out of print memoirs, and unpublished contemporaneous manuscripts, of Americans living in Germany during Hitler's rise to power. These Americans were journalists, diplomats, embassy workers. Some of them, like William L. Shirer and a few others, saw Hitler for the true menace he was. Others, who had plenty of company among German observers and German intelligentsia, thought Hitler a low-class buffoon incapable of rising very far. An interesting approach to a much studied subject: the rise of the Nazis as seen by Americans living in Germany. It's interesting to see people both catching and missing the essence of what was actually afoot. It leads you to wonder: in your own life, would you recognize this kind of evil if it slowly unfolded around you? The rise of Nazi Germany is probably one of the most documented and researched periods of human history, but Andrew Nagorski's Hitlerland examines an overlooked chapter: the presence and perspectives of Americans living in Germany - journalists, diplomats, students and socialites who had privileged front row seats to the turmoil and instability of the Weimar Republic, who watched the Nazi party charm and muscle their way to power, who felt the earth shake as Adolf Hitler launched the world into The rise of Nazi Germany is probably one of the most documented and researched periods of human history, but Andrew Nagorski's Hitlerland examines an overlooked chapter: the presence and perspectives of Americans living in Germany - journalists, diplomats, students and socialites who had privileged front row seats to the turmoil and instability of the Weimar Republic, who watched the Nazi party charm and muscle their way to power, who felt the earth shake as Adolf Hitler launched the world into war, and who were forced out of Germany when their own country entered the conflict. Hitlerland draws from a vast scope of journal entries, memoirs, autobiographies and manuscripts that intricately - and sometimes overwhelmingly - detail the moods and seismic shifts in Germany following its capitulation and humiliation in the aftermath of World War I. It makes the reading a little dense sometimes, but Nagorski's extensive presentation of long-forgotten historical anecdotes offers a uniquely American view of early 20th century Germany, one that is not usually taken into consideration when examining the hows and whys of the Nazi rise to power. Most people who are readers of German history immediately prior to WWII have read or should have read William Shirer's classic Berlin Diary which was written from his observations of the rise of the Nazi party. I would suggest that this book also be added to that list of "must-reads". The author uses sources from telegrams, letters, diaries, interviews, radio broadcasts, official diplomatic reports, etc. to expand on Shirer's idea of eye-witness accounts of journalists and diplomats stationed in Most people who are readers of German history immediately prior to WWII have read or should have read William Shirer's classic Berlin Diary which was written from his observations of the rise of the Nazi party. I would suggest that this book also be added to that list of "must-reads". The author uses sources from telegrams, letters, diaries, interviews, radio broadcasts, official diplomatic reports, etc. to expand on Shirer's idea of eye-witness accounts of journalists and diplomats stationed in Berlin from the late 1920s through 1940..........Ambassador William Dodd, journalists Howard K. Smith and Dorothy Thompson, radio commentator H.V. Kaltenborn, and many others whose names are not as well known. And of course, Shirer. These individuals were prone to all the normal human failings during a time of epic tragedy......many were superficial in their observations, some were deliberately blind, and a few became Nazi apologists. But all had to agree that Adolph Hitler had a combination of peculiar personal qualities and oratorical skills that fueled the rise of the Nazi party and the loyalty of the German people. This does a great job of giving a perspective of what it was like to see it all unfold. It was a little dry and not much of an overall story or plot, but some great episodes and worth the time and perspective. In this superb history based on copious research, the author documents the large number of Americans who visited or lived in Germany during the rise of Adolf Hitler and the Nazi Party in the 1920s and '30s. They included the famous such as former President Herbert Hoover, aviator Charles Lindbergh, and author Sinclair Lewis, well-known journalists of the time, most notably William Shirer, author of THE RISE AND FALL OF THE THIRD REICH, many state department officials, including three ambassadors In this superb history based on copious research, the author documents the large number of Americans who visited or lived in Germany during the rise of Adolf Hitler and the Nazi Party in the 1920s and '30s. They included the famous such as former President Herbert Hoover, aviator Charles Lindbergh, and author Sinclair Lewis, well-known journalists of the time, most notably William Shirer, author of THE RISE AND FALL OF THE THIRD REICH, many state department officials, including three ambassadors, and many others from all walks of life. Beginning in 1933, when Hitler became Chancellor of Germany, the nightmare began unfolding that culminated in the German invasion of Poland launching World War II on September 1, 1939. Americans stayed on in Germany until war was declared following the Japanese attack on Pearl Harbor on December 7, 1941, at which time all remaining Americans, mostly journalists, were interned under crude conditions in an isolated, mothballed hotel. Amazingly, while many American observers were well aware of (and condemned) the vicious Nazi persecution of Jews and other minorities, some were Nazi apologists right up to wartime. Partly this is explained by the fact that many were German-Americans and partly by the fact that racism and anti-Semitism were rampant everywhere in the 1930s. Also, outside the political realm, Germans and Americans generally were prone to hold each other in high esteem despite the tension created by the rise of Nazism. Still, it is mind-boggling to find that some Americans could be so blind to the gross human rights violations perpetrated by Hitler's regime. Among the colorful figures profiled in depth is the half-American Harvard College graduate, Ernest "Putzi" Hanfstaengl, who married another German-American from Hoboken, New Jersey. Husband and wife moved to Germany and became close friends and confidantes of Adolf Hitler when he was still struggling politically, and, in fact, Frau Hanfstaengl likely talked a despairing Hitler out of blowing his brains out with his pistol, much to humanity's misfortune. Putzi became a fervent Nazi, albeit somewhat of a jester and buffoon with his outsized physique and a personality to match who would jovially befriend American visitors and introduce them to the top Nazi leadership. Later he fell from grace and had to flee Germany for his life. Despite this, he never got over his awe for Hitler to his dying day. Another is Martha Dodd, the daughter of Ambassador William E. Dodd, who is profiled here in depth as she was in Erik Larson's IN THE GARDEN OF BEASTS: LOVE, TERROR, AND AN AMERICAN FAMILY IN HITLER'S BERLIN. Martha's is an intriguing case, because she was initially attracted to the Nazis and was somewhat of an apologist (and a lover of the first Gestapo chief, Rudolf Diels). However, when she discovered the ugly face of Nazi persecution and fell in love with a Russian envoy, she turned the tables and began spying for the Soviets. Martha and the wealthy American she eventually married, both longstanding Soviet spies, eventually fled to Prague, where she died in exile just before the fall of Communism. Still, her fate was not as grim as that of her good American friend during Berlin days, Mildred Harnack, one of the Red Orchestra Soviet spies, who was beheaded by the Gestapo along with her German husband, the only American woman to be executed by direct order of Adolf Hitler. Her last words were, "I loved Germany so much." Very highly recommended, particularly for twentieth century history buffs. A well-written and interesting book on the Americans that witnessed Hitler’s rise to power and their differing perspectives on it. The book is a fairly easy read. Some of the stories have been well-documented elsewhere, while others are new, at least to me. Nagorski brings together the recollections and experiences of all the Americans involved, although the context he provides is sometimes limited. It usually isn’t in-depth enough, but, then again, I assume the reader has at least a basic knowle A well-written and interesting book on the Americans that witnessed Hitler’s rise to power and their differing perspectives on it. The book is a fairly easy read. Some of the stories have been well-documented elsewhere, while others are new, at least to me. Nagorski brings together the recollections and experiences of all the Americans involved, although the context he provides is sometimes limited. It usually isn’t in-depth enough, but, then again, I assume the reader has at least a basic knowledge of the Nazis’ rise to power, so this isn’t a huge issue. Another problem, however, is that Nagorski often quotes the various eyewitnesses without providing a critique or analysis of what they said. Nagorski does give us a good portrait of Berlin between the world wars, which in that time was a bit of a party town, even as the Nazis came to power. He also gives us good portraits of the various eyewitnesses, some of whom figured out who Hitler really was--a dangerous fanatic--even before he was well-known, and some who were fooled by his charisma and even actively assisted him. In any case, all of these witnesses were also busy living the high life in Berlin, and some of them were actually depressed by the new Nazi order Hitler ushered in. This is a brilliant book sharing the point of view of diplomats and Western journalists in Germany from the 1930'3 to 1942. Many quotes and diary accounts are included and I can say it is unlike anything I've read. Underneath each account is our realization of what was coming or the real danger in which these people found themselves. It's like a horror movie when we cry, "Don't open the door, don't go down the basement stairs". Hitler's hypnotic charisma was reported over and over again to exist only in his public speeches. It didn't extend to his personality or any social graces or friendships or women. From the observations of Hitler's early beer hall speeches to the parties, food and liquor given freely to the the diplomats and press we see Germany's special treatment of Americans. This was a purposeful action to keep the Americans out of any war. Their is a story, 1922, of Hitler fleeing the police and putting a gun to his head, only to be talked out of it by a diplomat's wife, with whom he had a close relationship, Helen Putzi. What's really fascinating is that even as Hitler seized power, turned Germany into a police state, annexed his neighbors and started a war, almost all of the American journalists and diplomats still refused to believe what was happening until the very end. To the point that many felt the need to lie about their initial impression of the Nazis and Adolf himself during and after the war. In these times the impressions of Americans living in prewar Nazi Germany and journalists doing their work on the scene could be instructive in resisting a similar fate now in Trumpland. A well written and documented history of those times. Very enlightening. Eerily similar to current life in the U.S.
Hitlerland, published in 2012, tells the story of journalists and diplomats, their wives and families present in Germany from not long before the 1923 Beer Hall Putsch and Hitler’s subsequent arrest, up until the U.S. entered World War II. Unlike great accounts, such as Rise of the Third Reich by William L. Shirer, this book looks at their perceptions at that moment with no gift of hindsight. Drawing on published and unpublished sources, that include observations by a very young John F. Kennedy Hitlerland, published in 2012, tells the story of journalists and diplomats, their wives and families present in Germany from not long before the 1923 Beer Hall Putsch and Hitler’s subsequent arrest, up until the U.S. entered World War II. Unlike great accounts, such as Rise of the Third Reich by William L. Shirer, this book looks at their perceptions at that moment with no gift of hindsight. Drawing on published and unpublished sources, that include observations by a very young John F. Kennedy and by future CIA Chief Richard Helms, the book gives an interesting look at the Germany of that era as seen from the top tier of the diplomatic corps and the corps of foreign correspondents (and a few others). Fascinating and detailed accounts of diplomats, newspaper reporters and businessmen who visited Nazi Germany before and up to the start of WW2. Eye-opening accounts from diaries and interviews of the foreign visitors who interacted with everyone from Hitler on down the line of bureaucrats who floated in the top circles of the German government. The description of German Jews and their varying reactions to the escalating dangers is heart-rending. If you had visited Germany in the 1930s and met Hilter in person what would you have thought, without the benefit of hindsight? Many US diplomats and journalists did. They then wrote without benefit of seeing the future. It is very interesting. The women often wrote that Hitler seemd to be a 'neuter', likely not to have ever had or have a sexual relationship with a woman. Hitler was described a effeminate. I never gathered that from the TV histories. Andrew Nagorski, award-winning journalist, is vice president and director of public policy at the EastWest Institute, a New York-based international affairs think tank. During a long career at Newsweek, he served as the magazine's bureau chief in Hong Kong, Moscow, Rome, Bonn, Warsaw, and Berlin. He lives in Pelham Manor, New York. “Did he believe all that he said?' he asked. 'The question is inapplicable to this sort of personality. Subjectively Adolf Hitler was, in my opinion, entirely sincere even in his self-contradictions. For his is a humorless mind that simply excludes the need for consistency that might distress more intellectual types. To an actor the truth is anything that lies in its effect: if it makes the right impression it is true.'"